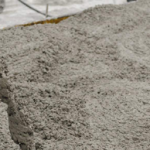 Nearly 60% of the cement used is ordinary Portland cement. It is one of the most important binding materials and admirably suited for use in general concrete construction, where there is no exposure to sulphates in the soil or in groundwater. It has a medium rate of strength development and heat generation .it has an adequate resistance to dry shrinkage and cracking but has less resistance to chemical attack. This type cement contains a high percentage of lime than ordinary cement. It is burnt at a very high temperature and fine grinding is done, which enable it to attain greater strength at early ages; that is way it know as high – early strength cement or rapid hardening cement. This cement is used in construction work where early strength is necessary for early removal of from – work for reuse to open the road to traffic with minimum darkly winter concreting, urgent repairs works, wall & sealing etc. This type of cement is manufactured by reducing the percentage of lime and alumina. The heat hydration in this cement is very low. The high of hydration generated in mass concrete structure is dangerous because it may cause cracks due to development of internal stress during setting. 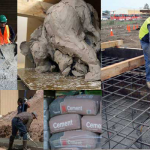 Hence low heat cement which generates low heat of hydration is very suitable for a mass concrete structure such as retaining walls, dams, and bridges etc. This type of cement has the quick setting property hence on adding water to it this cement starts setting within five minutes of adding water to it. This property is archived by reducing the percentage of gypsum and adding a certain amount of sulphate during the grinding process of manufacture of cement. It is used where concrete work is to be completed in very short time such as concreting in a static or running water. This type of cement is manufactured by reducing the percentage of tricalcium acuminate below 6 %. it resists the action of acids, alkalis fumes, games, and seawater. Hence, it is used for the construction of tanks, pipelines, sewers etc. at a chemical plant. It is also used for the construction of docks harbors, to protect them from the action of seawater. Slag is a waste product in the manufacture of pig-iron. Slag is a mixture of lime, silica, alumina. It is similar to ordinary Portland cement is used. But in a view of its low heat evolution, it can also be used in the mass concrete structure, such as resistant to sulfate attack and is specified for marine work pipe carrying water containing chemical or sewage. White Portland cement is white in color. It is made from raw materials containing very little iron oxide and manganese oxide. It is useful for works such as external renderings of the building, facing slabs, flooring, bathrooms, water closet, swimming pools, ornamental concrete product etc. super sulphated cement is made by inter-grinding a mixture of 80 to 85% of granulated slag with 10 to 15% of calcium sulfate and about 5% Portland cement clinker. It is obtained by claiming and grinding the so-called cement rock, which is a clayed limestone containing about 25% argillaceous material. The resulting cement and is an intermediate product between Portland cement and hydraulic lime. This type of cement is manufactured by mixing aluminum are bauxite and lime. It is a type of rapid hardening cement. Its initial setting time is 3.5 hours and final setting time is 5 hours. This is a cement of inter-ground or blended mixture or portland cement pozzolana. Pozzolana is natural, or artificial material containing silica and alumina in a reactive form. The ordinary cement when used in masonry, given a harsh mortar because of its sucking of water by masonry, which results in poor bond. This special oil-well cement used for sealing oil wells. After drilling is completed, the wall of the well must be prevented from collapsing and the ground water kept out of the good shaft. Here water-proof materials such as calcium steerage, aluminum steerage and gypsum treated with tannic acid , are added to ordinary Portland cement during the process of grinding.